“I do not want my writing to be converted into a commodity, or be capable of being digested in the intestines of middle-class babudom,” Subimal Misra wrote in his 1982 work, Actually This Could Have Become Ramayan Chamar’s Tale. There is little chance of this happening. The two collections of his short stories that have been published in English so far, The Golden Gandhi Statue from America: Early Stories (2010) and Wild Animals Prohibited: Anti-Stories/ Stories (Harper Perennial, 2015) are loved by poets, film-makers, fiery aspiring artists, exchanged between members of this fellowship like rare gifts. But Subimal Misra’s stories will not be sold at traffic lights, will not be pirated, any more than you will see the author exchange his 3-room house, filled with 15,000 books, for a television studio. There is a subtle danger to this, as the poet Sharanya Manivannan writes: what if Subimal Misra is propelled to a celebrity he has derided throughout his career? “What will happen then, when his cult becomes conventionally cool?” It is a fearsome thought: the stories in Wild Animals Prohibited are not easily co-opted, as the titles will tell you (Meat Was Bartered, From The Morgue on Bhawani Datta Lane, Mohandas and Cut-Ball), but in some apocalyptic future, terrible things might happen to them. Misra’s stories might become influential in the same way Kolatkar’s Jejuri was, a generation genuflecting to the craft of the poem while completely ignoring what the poet had to say about the hollowness of religious ritual; hipsters might read them aloud; reviewers might write sweet notices praising his skill in the pink pages of business papers. One of these three dire fates has already overtaken him, but Misra is prepared for this, too, and has written his own reviews in the brief comments he’s made for the preface. He says that his writing does not conform to the kind of reading that has gained currency, and this is partly true, though writers like Hansda Sowvendra Shekhar are, like him, writing from outside the space of the headlines, paying attention to the world that does not trend on Twitter. He says that readers will definitely be dismayed, and this, too, is only partly true: it takes a strong stomach to stay with his reports from the morgue, from the rotting body in a sack whose stench poisons a city, the half-whores and full-whores, but he reels you in, even as he plays games with language, arranging his sentences into one of his famous collages. A director struggles to corral the red-light district, Sonagachi, into a frame that stays away from the “very sweet” version created in the Bengali market: bel flowers, tittering laughter, tears, Parvati, Devdas. A writer sees an opportunity to make money by interviewing the man who makes a living playing Gandhi. The Naxal years leave bloodstains and a trail of vanished citizens across some of his stories. One of Misra’s cautions is valid: these stories carry the mark of a particular time, and as he had feared, some have indeed dated. But one of the joys of this collection and The Golden Gandhi Statue is that V Ramaswamy goes far beyond the traditional tasks of a translator. 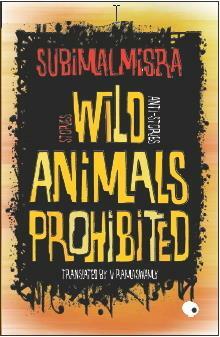 The introductions, interviews and short essays appended with each book are something of a master-class in understanding Subimal Misra, and in understanding the world of Bengali writing that he emerged from, even though he has so successfully resisted being part of that universe. Ramaswamy’s brief critical essays are, like his translations, simple, lucid and skillful. “In Bengali, a book is called boi, and a film, which is called chhobi or picture, is also often referred to as boi, because films used to be based on popular or famous novels or books. Subimal Misra, however, calls his stories films, or chhobis,” Ramawamy writes. This simple insight provides the only key you need to the work of this uncompromising, influential Calcutta writer; it explains why long after you have put his stories aside, Subimal Misra’s images haunt your imagination.